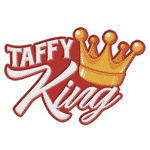 Taffy King is a premium USA eliquid that has arrived in the UK in 100ml 0mg short fills. Experience taffy flavours like never before with 4 flavours including, Strawberry Taffy, Watermelon Taffy, Cotton Candy Taffy & our favourite Apple & Kiwi Taffy. Simply add x2 18mg nicotine shots for 120ml in 3mg.